A new feature in Chrome radically improves the quality of video casted from the browser to your Chromecast—but only if you toggle a hidden setting on. If you’ve used the screen-mirroring function to send video from the Chrome browser to your Chromecast, you’ve certainly noticed one thing: the feature is a bit rough around the edges. That’s because unlike casting a video from your phone (where your phone simply tells the Chromecast where to look and the Chromecast grabs the direct video stream), tab casting transcodes the video for the Chromecast and it is passed along in this altered state. The end result is typically pretty bad, and even if the video on your computer screen is beautiful (like a nice HD video stream from Vimeo or a sports broadcast from NBC), the video that shows up on your HDTV looks like a janky mess. It works, but it isn’t pretty. Fortunately, a brand new feature in Chrome allows you to significantly improve the quality of tab casted videos with a tiny tweak. Once you toggle the setting on, Chrome will attempt to pass along the actual video stream, unaltered, to your Chromecast, instead of the entire tab. If it works, you’ll get beautiful video from services that don’t currently offer direct Chromecast support. Even better, if it doesn’t work, it’ll juts fall back to normal tab casting—this feature doesn’t break anything. 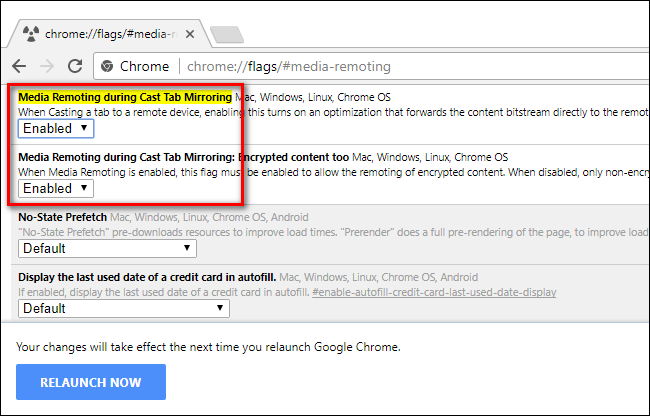 Once in the Chrome flags menu, simply toggle “Media Remoting during Cast Tab Mirroring” from “Default” to “Enabled”. While that’s technically all you need to do to turn it on, let’s cover our bases: go ahead and toggle secondary entry “Encrypted content too” on. Then click “Relaunch Now” to restart Chrome. To take advantage of the new setting, all you need to do is visit a streaming video site (Vimeo is a great one to test with, as we can confirm it’s working and it has lots of HD content) and select a video to watch. Then, cast like you normally would: go to Chrome’s menu, choose the Cast option, and select your Chromecast. Then, once it’s running, set the video to full screen (you must switch to full screen for the feature to turn on). If the video stream can be directly sent to the Chromecast, the in-progress video will vanish and be replaced by this screen. If you don’t see that screen, that means the improved tab casting isn’t working on that site, and you’ll just get the normal low-quality tab casting. We’re pretty confident you’ll be blown away by the difference in both the audio and video quality. With most of the videos we tested, the change quite dramatic; the video quality went from worse-than-SD-TV played through a speakerphone to perfectly-HD video with crisp audio thanks to this simple change.